Thanks for all your encouragement about finishing those UFO's! I'm happy to report that I've finished one and am working on the others! Aren't the daffodils just amazing? They are one of my favorite parts of spring. These photos were taken in the Prince's Street Gardens (very near the train station) and it was perfect timing to get all the daffodils in bloom! I absolutely adore the collar on this suit jacket...it was super easy to put together despite the VERY limited instructions. The sleeves are really great! I did have to do about three different sleeve muslins to get the length and tightness right and I sort of winged it in terms of putting them together (since there were very few instructions)...which may account for the fact that they were tighter than normal. But I think it looks fine! I wonder what kind of little blue flowers these are in the background? Forget-me-nots? Thanks to David for getting such fabulous pictures!! This is so lovely. And the hat and the hair just make it better. I love it! I think I may have to add some suits to my wardrobe soon. You look so classy! You look so beautiful. Love your hair and hat. Gorgeous jacket. Beautiful outfit, that jacket is great! The suit looks absolutely beautiful on you! The sleeve details are just genius. AMAZING. totally. you've blown me away, girl! That collar is to die for, and hello you look so adorable! No, no no more UFOs for you, this is too good to put in a UFO pile! I love it! Great suit and great pics! Now that is just perfect! I love your accessories too - congratulations on getting it out of your 'to do' pile! You are just so classy in a suit! It suits you so well (no pun intended, lol). It looks great and I love the sleeves in particular, what a superb little detail at the back of the arms! Gorgeous! This is so flattering on you! I love the hat too - perfectly pretty : ) The collar and sleeves give it a bit of richness and the cut and fit is so classic - beautifully done! Dein Kostüm ist ja zauberhaft. A gorgeous suit! And I'm so envious of the backdrop - daffodils are my favorite flower and to have a big field of them is fantastic. It's stunning! You must be so proud with a suit like that in your closet. Girl, you can sew anything, you are amazing! Gorgeous! And I agree with Anna, those flowers look like scillas. this is fantastic, you look stunning in this suit! You have done an amazing job on the suit, truly fabulous! LOVE IT! Fabulous job. So chic! I love to wear my 30s suit jacket with other things, too, so you should have lots of ability to mix and match both pieces! You're so talented! Beautiful! I love that sleeve detail, and you look stunning in the hat! Pretty pics too, keep it up David! Amazing! Your sewing is so professional Debi. And the photos are just gorgeous - really show off spring time. Brilliant work here and you look stunning as always. Beautiful! As always, gorgeous photography and lots of cold-weather-clothes-envy from my side of the world. I could maybe wear that to celebrate the winter solstice here, but only with the A/C on. I think this is becoming one of my favorite blogs! You did a wonderful job on this suit. Visually, I love everything in these pictures: the amazing suit, lovely curls, stunning hat, beautiful smile, adorable shoes . . . the black and white pictures are also so well thought out. WOW. I think that's all I can say. WOW. The detailing on this is simply stunning, which is also how you look in this. Great suit. Give the gardens another couple of weeks and all the rest of the bulbs will be out and maybe even the flower clock will have flowers too. The little blue flowers are called (well here at least - I don't know what they are called in Scotland) 'blue squill'. Beautiful suit dress! You look wonderful in it. As for the little blue flowers, they look more like Chionodoxa (or Glory of the Snow) than Scilla to me. Whatever they are, though, they provide a lovely background for your beautiful outfit! And the daffodils. Sigh. They are still at least a month away in Sweden. And yes, skillas, I think. Forget me not are more of a summer flower. Stunning! This suit is just wonderful, I love the fur accents. You - your suit - and your city are looking great! The collars and the cuffs are just such great details; the 30s really had a corner on the market for elegance in details! :) You look gorgeous, Debi! I am so intrigued by those sleeves and your photos are great. Looks like England! You look lovely - like you just stepped out of the pages of Vogue, 1931! It's wonderful illusion that I hope your termination of suits and dresses, each more than the previous one and that's what you got with this suit. Fantastic and original, love, love your look! Exquisite! Fantastic! I'm determined to start sewing (more than just fixing buttons or making simple curtain panels), so I'm visiting a few blogs to get inspired. This is far beyond my abilities (for now! ), but very inspiring!! It's wonderful, Debi! You look right at home in the suit which looks right at home amidst all those splendid daffodils-what a picture! Fabulous! I'll have to browse through all the things you've made since I last spent time looking through my favourite sewing-blogs (I've been in hibernation all winter...). The little flowers are Glory-of-the-snow's (Chionodoxa forbeesi, or Scilla forbeesi we call them Chionodoxa's here in Sweden). Loads of people call them Scilla's but the Scillas nod their heads and are another blue colour (more petrol-blue). I'm a landscape architect, that's how I know. I try to put them here and there, they really brighten up early spring! You look amazing and the hat is absolutely perfect! Did the eva dress pattern work well? I'm consider getting the 6000 pattern from them, but I have no experience sewing vintage patterns and feel a little nervous if that is a good one to start with. You are very inspiring to me! The EvaDress pattern was amazing. They are basically reproduction patterns (with clearer instructions) based on original patterns. This suit is actually a 1931 McCall pattern. 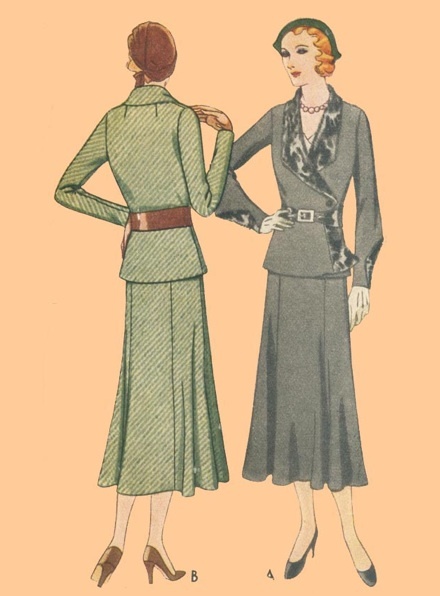 I find vintage patterns (at least from the 30s and 40s) much easier to sew than modern patterns. I think EvaDress 6000 would be a nice one!! Let me know how it goes!